As part of a five-year agreement, UCF will work with the technology powerhouse to evaluate and develop educational initiatives ranging from research and teaching to optimized learning environments. The UCF College of Business has launched its first podcast, which looks at a variety of current topics to determine if they are just hype or if they represent fundamental change that could alter how we do business. The podcast is available on iTunes, Google Podcasts, Google Play, Stitcher, TuneIn, Spotify or by visiting business.ucf.edu/podcast. In September, the Virga family committed $10.25 million to support business and athletics programs at UCF. Just days later, UCF was fortunate to receive another large gift from alumnus Jim Rosengren and his wife Julia, who made a $1 million donation to the UCF RESTORES PTSD clinic. This gift, combined with their previous commitments totals over $7.95 million in support from the Rosengren family. We are so grateful to these Knights and their families! Speaking of fundrasing, ever wonder why we do it? Three-time graduate and associate director for advancement, Curtis Proctor, explains how we build bridges through philanthropy. Our next Indoor Tailgate takes place this Saturday, Oct. 6, so register now! Please note that doors close 15 minutes prior to the end of the tailgate. Our UCF Alumni Chapters and Clubs across the nation host watch parties for every UCF Football game of the season. So if you can't be there in person to cheer on the Knights, find a UCF Watch Party near you! Wednesday, Oct. 17 from 7:30-9:30 a.m.
Join us at a breakfast reception for alumni and friends of the university as we welcome President Whittaker to Atlanta. We will enjoy an enhanced continental breakfast as we mix and mingle with fellow Knights and learn more about the future of UCF from our distinguished guests. Please RSVP in advance for this special opportunity. Tuesday, Oct. 9 from 6-8 p.m.
After landing her dream job writing for Rolling Stone at the age of 21, Zfat recognized the growing demand for digital and started her social media consulting company. Zfat is a sought-after expert who has partnered with some of the world’s most iconic brands, including Samsung, American Express, NFL, Microsoft and Marriott International. This October, she's sharing her secrets to success with fellow Knights. Tune in for a discussion moderated by Rick Brunson '84, associate professor of the Nicholson School of Communication and Media, on how to leverage social media, manage your personal brand and embrace the entrepreneurial spirit. This event has sold out, but we will stream it LIVE for those who cannot attend. You can RSVP for the livestream here, or email us if you'd like to be added to the in-person event waiting list. Wednesday, Oct. 10 from 7-8 p.m. 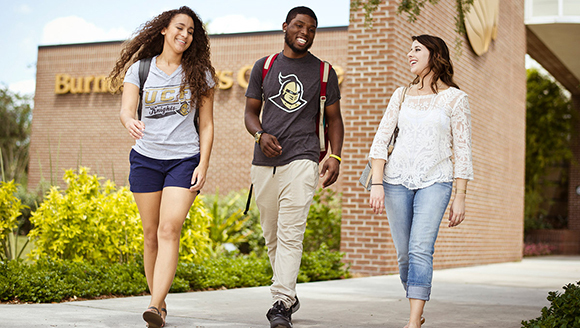 The Legacy Admissions Workship gives UCF alumni and friends an inside look at ways to help the next generation of Knights apply for college. If your child or family member is considering UCF or another Florida university, this workshop will emphasize the special planning necessary to maximize opportunities in a highly competitive admissions market. This workshop is appropriate for students in sixth grade through senior year in high school. The Legacy Admission Workshop will be held at the UCF Live Oak Ballroom and simulcasted for those who cannot attend in person. Find a full list of UCF Alumni events at ucfalumni.com/events. 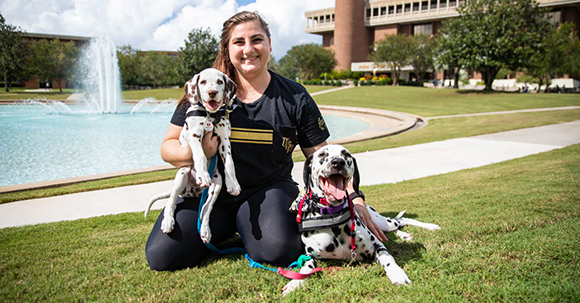 Alumna Casey Bruno's viral dalmatian shows how service dogs can help with depression. As a crisis-management lead for Lockheed Martin, Ron Hawks '12 directs hurricane relief efforts. And the Emmy goes to...Jeremiah Graves '12MS! FIEA alumna Karen McCarthy ’13MS is changing the game for EA SPORTS. The reason Pluto lost its status in 2006 is not valid, according to a recent study led by planetary scientist and UCF alumnus Philip Metzger. Lindsay Holmes ’12 discusses what she has learned as a senior wellness editor for HuffPost in New York City. UCF alumnus Larry Bradley ’94 wins Neil Armstrong Award of Excellence for his contributions to space exploration. Andrew Carnero ’15 opens up about stage managing Broadway’s hit play, Harry Potter and the Cursed Child. UCF Alumni David Schwartzberg '18 and Jacob Boyer '18 have developed a dress shirt that is resistant to sweat and stains.